The MST organizes five informative meetings a year for our members, in October, November, February, March and April. Guest speakers are invited to give presentations on various topics associated with the field of mycology, usually illustrated with slides. MST meetings are held in the Auditorium of the Toronto Botanical Garden, located at the southwest corner of Leslie St. and Lawrence Ave. East in Toronto. For General Meetings, meet by 7:45 pm unless indicated otherwise. Refreshments are served following meetings. Members of the public are welcome as guests to attend one meeting prior to joining the Society. MST members have access to videos of meeting speaker presentations after each meeting. Monday, October 22, 2018 7:00 p.m. There are myriad relationships between fungi and animals that go way beyond members of our own species' foraging for them for food. A plethora of other creatures also feast on fungi, ranging from minute fungus-gnat larvae, to gluttonous slugs, to honey-mushroom-thieving deer. Many fungi also depend on animals to aid in the dispersal of their spores, including parasitic Cordyceps species that practice "mind control" on ants. And what kind of world would it be without the thousands of species whose business it is to recycle dung? Jan Thornhill has been studying the plethora of amazing fungi she finds around her home near Havelock for more than 25 years. Though she is not beyond eating the choice ones, she is much more interested in fungal diversity, ecology, and collecting the weird and wonderful, all of which she obsessively photographs, catalogues, and preserves. For the past several of years, she has also been writing about her favourite oddities on her blog: https://weirdandwonderfulwildmushrooms.blogspot.ca. Jan is also a multi-award-winning writer and illustrator of science- and nature-based children’s books, some of which she will have for sale, including her most recent title, The Triumphant Tale of the House Sparrow, a companion volume to The Tragic Tale of the Great Auk. Monday, November 19, 2018 7:00 p.m.
Antonio will cover the history of mushroom cultivation and the different techniques used to grow edible and medicinal mushrooms, with particular attention to home cultivation techniques. Antonio Cillero has been a member of the MST for 3 years and currently holds the position of Assistant Foray Director. He has been growing mushrooms as a hobby for ten years and teaches mushroom growing classes in Toronto. He is also a member of Canadian Students for Sensible Drug Policy (CSSDP) and helps organize a conference on the therapeutic applications of psilocybin mushrooms called “Mapping the Mind with Mushrooms”. Tuesday, February 19, 2019 7:00 p.m.
MST Movie Night! Come and have some popcorn! A real life science fiction movie exploring a world creeping right beneath our feet, where time and space are magnified and intelligence redefined. 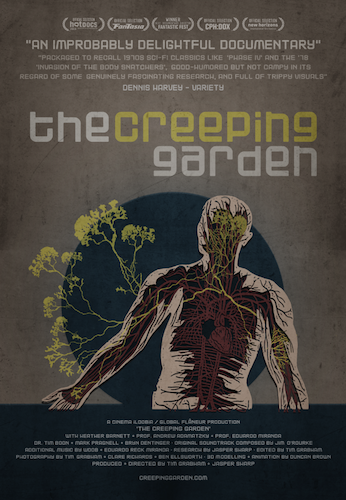 The Creeping Garden is a multi award winning feature length creative documentary exploring the work of fringe scientists, mycologists and artists, and their relationship with the extraordinary plasmodial slime mould. But as well as exploring the slime mould in the lab, the film also travels out into the wild, hunting for the organisms in their natural habitat. Co-directed by artist film-maker Tim Grabham and writer and film curator Jasper Sharp, the film follows in the unconventional footsteps of Grabham's previous feature 'KanZeOn' and Sharps fascination with the extended world of mycology. With an original soundtrack composed by celebrated musician and producer Jim O'Rourke (Sonic Youth, Werner Herzog's 'Grizzly Man') this is a unique exploration into a hitherto untapped subject matter, observing and immersing the audience into the worlds of the observers and the observed. Program length: approx. 80 min. Monday, March 18, 2019 7:00 p.m.
Queen's University Biological Station (~50 minutes north of Kingston) is located in a biologically diverse region of Eastern Ontario known as the Frontenac Axis (aka Frontenac Arch). In 2009, the station offered its first Fabulous Fall Fungi workshop to the public. Fast forward to the present day, and there are now a minimum of three sessions offered each year. In this talk, FFF founder/instructor Richard Aaron will highlight some of the many interesting and unusual species collected in these workshops over the years, accompanied by interesting anecdotes. For workshop details, visit https://qubs.ca. Richard has been an avid naturalist for more than three decades. Over the years, he has given walks, workshops and lectures to over 90 organizations spanning a variety of topics, ranging from wildflowers and trees, to birds, to dragonflies and moths. And, of course, fungi and slime moulds. Richard has been a member of the MST since 1994. He has contributed articles to the Mycelium newsletter, served as a foray leader, formed the microscopy study group (currently dormant), and single-handedly created the MST's first species checklist back in 1998. This is Richard's fourth time speaking to the club. His nature website is at https://natureknowledge.weebly.com.